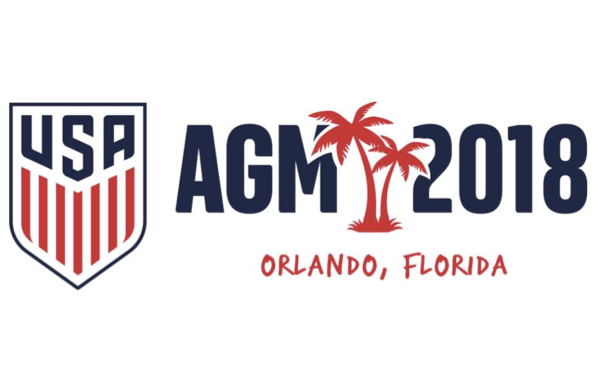 The 2018 U.S. Soccer Annual General Meeting (AGM) is set to take place this week in Orlando, Fla. While the event occurs annually, this year’s edition has gathered significantly more attention with the inclusion of the election of the next president of the U.S. Soccer Federation. With U.S. Soccer being a non-profit, membership-based organization, the Federation is required to hold an annual meeting to discuss, plan and perform the governance of the organization and its policies for the coming year. The event encompasses numerous meetings between the diverse U.S. Soccer membership that makes up various councils. Those councils deliberate on and then pass or discard policy affecting everything from grassroots youth soccer to the professional game. For a full list of meetings and other events, visit ussocceragm.com. Event attendees are mostly made up of representatives from U.S. Soccer’s membership that makes up the organization’s respective councils (Adult, Athlete, Professional, and Youth). This year the fans from U.S. Soccer’s official fan club (Individual Sustaining Members) will be sending two delegates to participate in the meeting. Additionally, U.S. Soccer’s Board of Directors, former athletes and guests attend and take part in the meetings. U.S. Soccer award and National Soccer Hall of Fame honorees also often attend the AGM . For more information about the various council membership, please click here. The 2018 AGM will be held from Feb. 8-11 at the Renaissance at SeaWorld in Orlando, Fla. Recent AGM locations have been New York City (2014), San Francisco (2015), San Antonio (2016) and Wailea, Hawaii (2017). Click here for a listing of previous AGMs. The spotlight is shining bright on the 2018 AGM as membership will gather at the National Council Meeting to elect a new U.S. Soccer president, replacing Sunil Gulati who has served in the role since 2006. The NCM is set for Saturday, Feb. 10, and a field of eight candidates are vying for the job in the U.S. Soccer’s first contested presidential election since 1998. The list of candidates (in alphabetical order): Paul Caligiuri, Kathy Carter, Carlos Cordeiro, Steve Gans, Kyle Martino, Hope Solo, Michael Winograd and Eric Wynalda. Click here for candidate bios and an explanation of how the election will work. U.S. Soccer will provide live coverage of the entire National Council Meeting, including the election, beginning at 8 a.m. ET on ussoccer.com and YouTube. The election portion of the meeting will also be shown on U.S. Soccer’s Facebook page beginning at approximately 9:30 a.m. ET. Once a new president has been chosen, the focus of the day will shift to the 2018 Anniversary Dinner, where four individuals will be honored. Three members of the 2017 Hall of Fame class will be inducted. Former U.S. WNT goalkeeper Briana Scurry will be inducted in the Player category, while former U.S. MNT assistant coach, referee, administrator and current FIFA match commissioner Dr. Joe Machnik enters the Hall of Fame as a Builder. Additionally, the late Tony DiCicco will be posthumously conferred the Werner Fricker Builder Award, the top honor that can be given to an individual or individuals by U.S. Soccer. One of the most popular figures and leaders in women’s soccer history, DiCicco is the all-time winningest coach in U.S. Women’s National Team history, was part of the coaching staff that won the first FIFA Women’s World Cup in 1991, led the USA to the first Olympic gold medal for women’s soccer in 1996 and of course was at the helm of the USA’s historic run to the 1999 Women’s World Cup title. Finally, long-time American soccer media professional Jim Trecker, who worked with the North American Soccer League, New York Cosmos, U.S. Soccer and on the 1994 and 2002 FIFA World Cups, will receive the Colin Jose Media Award. The award was created to honor the contributions of members of the print and electronic media, including reporters, columnists, authors, broadcasters, editors, public/media relations professionals and others who specialize in communications concerning soccer in the United States. The National Soccer Hall of Fame ceremony will be streamed live on ussoccer.com, YouTube and Facebook beginning at 7 p.m. ET.